H2G2 radio series 30th anniversary : the review & some pictures! The Hitchhiker’s guide to the galaxy 30th anniversary live performance was a great success. The historical event, which occured just after the Douglas Adams 6th Memorial lecture on wednesday 12th march at the Royal Geographical Society, was sold out. First surprise of the evening : John Lloyd (who co-wrote with Douglas the episodes 5 and 6 of the original radio series – and later “the meaning of Liff”) introduced the lecture. The lecture by Steven Pinker (“The stuff of thought : language as a window into human nature) was smart and rather funny. I didn’t understand everything because 1) I’m french and 2) i didn’t have glasses and couldn’t read what was on the screen. James Thrift, Douglas’ brother, made a wonderful job as the auctioneer during the fundraising auction for Save the Rhino and the Environnemental investigation agency. Sadly the rare handcrafted model Vogon wasn’t sold. 2.000 pounds was however a worthy price for this masterpiece! 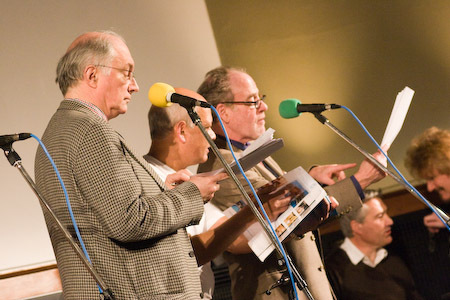 It was really very moving to hear “the journey of the sorcerer” and see most of the original cast performing the second episode of the Hitchhiker’s radio series (sadly Mark Wing Davey – Zaphod – could not be here). On stage we had Simon Jones (Arthur), Geoffrey Mc Givern (Ford), Susan Sheridan (Trillian), Stephen Moore (Marvin) from the original cast. Roger Gregg played Eddie (a role he already performed in the new H2G2 radio series). Philip Pope was Prostetnic Vogon jeltz. And we had two fine guests : Michael Cule who was the Vogon guard in the TV series and not least than Geoffrey Perkins (who directed the original radio series and became afterwards one of the biggest british TV producer) as the voice of the book. All the cast made an excellent work and the result was really enjoyable. Dirk Maggs who directed the performance wanted it to be as close as possible as the original… and it was a success, a very moving event for all the fans of the original show. Thank you to Dirk (but also to James Thrift who co produced the live performance). For those who have missed this event, I should add that the great Kevin Davies (auhtor of H2G2 TV making of and artistic director of the illustrated guide) has filmed the performance. So let’s cross our fingers. You can see exclusive pictures of the evening HERE.